In recent weeks, as the high school baseball season comes to a close, it bodes well that a number of UP recruits for the coming school year are being recognized with various awards, but it was the recognition of Cody Hawken as the Washington Gatorade Baseball Player of the Year award today that caught my attention. The Columbian wrote: At the time of his selection, the 6-foot-3, 205-pound senior outfielder had led the Titans to a 14-3 record and the Class 4A state tournament. Hawken batted .465 with seven home runs and 30 RBI through 17 games. The 4A Greater St. Helens League Player of the Year, he produced a .582 on-base percentage and a .986 slugging percentage with 18 of his 33 hits going for extra bases entering the regional round of the postseason. With that high GPA, Hawken's academic scholarship will not count against the NCAA mandated 11.7 maximum number of athletic scholarships. I think we can be confident AD Scott Leykam is working overtime to bring in the quality coaching that matches the quality facilities and recruits that are the future of UP baseball. I'm pretty sure by NCAA rules that is he signed an NLI as the article implies he will count against the 11.7 maximum numbers since to sign an NLI it's required that you have a baseball scholarship. Raider1 wrote: I'm pretty sure by NCAA rules that is he signed an NLI as the article implies he will count against the 11.7 maximum numbers since to sign an NLI it's required that you have a baseball scholarship. There is no stipulation on amount of agreed money for any NLI except in Football or Basketball. In those sports you must get a full scholarship or nothing, but you might still have to sign to play. The key is his scholarship isn't athletic. The 11.7 scholarship equivalent money can go to other players. His agreed upon scholarship money might be bagels( no peanut butter). It is often as little as books. DoubleDipper wrote: With that high GPA, Hawken's academic scholarship will not count against the NCAA mandated 11.7 maximum number of athletic scholarships. You'll notice that I wrote that the academic portion of Hawken's scholarship won't count against the 11.7 athletic scholarship mandate because his GPA is above 3.5. As he signed a NLI he is certainly receiving some athletic scholarship money, but just how much is between him and the UP Athletic Department....a good guess might by 50/50, but based upon his GPA, his academic aid could be quite a bit more than his athletic grant-in-aid. Geezaldinho wrote: There is no stipulation on amount of agreed money for any NLI except in Football or Basketball. In those sports you must get a full scholarship or nothing, but you might still have to sign to play. Geez, I'll need to check further, but I believe the NCAA now allows spreads such as peanut butter on the bagels....a BIG breakthrough. Yah, I knew that. But it's more fun this way. Since it's been quiet here.... With Oregon St and Oregon now out of the NCAA Tourney, I wonder if things in the coaching search pick up this week... Any comments or rumors? Raider1 wrote: Since it's been quiet here.... With Oregon St and Oregon now out of the NCAA Tourney, I wonder if things in the coaching search pick up this week... Any comments or rumors? My thought exactly when I heard the Ducks and Beavers were done. I have heard nothing about candidates, but I've been told Scott Leykam wants to get it done "sooner than later." The roster for this coming year is pretty much taken care of, but there will be at least 10 openings on the roster for the following year, so contacts have to be made and the current assistant coaches must learn their fate soon. Well, some of the chips are beginning to fall... Washington State just announced their new coach (who comes to them from OK state and before that Oregon St http://www.wsucougars.com/ViewArticle.dbml?DB_OEM_ID=30400&ATCLID=210128889). Can/will UP spend the money to bring someone to the Bluff with similar credentials? Probably not, but there have got to be some very talented and charismatic young assistants out there that would jump at the chance to coach at UP. There may be a number of "plumb" collegiate jobs still available, unfortunately the bar has not been set very high at UP in recent years.....however, a look at the current talent, incoming recruits, and first class facilities would indicate the program is ready to take off under the right leadership. Another chip falls...and another chip added... Western Kentucky is off the list (they just hired Pawlowski) and hearing that Clemson now has a vacancy. With Scott Brosius off the board and apparently heading to MLB, another candidate that should get some attention from a number of D1 schools, especially UP, is UP alum, Geoff Loomis. Probably the weakest aspect of the Pilots game in recent years has been hitting, and Geoff knows hitting! Not only is he a UP grad, he was the Pac-10 player of the year in 1992 (yes, UP at one time played in the Pac 10) and was in the A's system for a while before becoming a teacher at David Douglas after getting a graduate degree from Pacific. 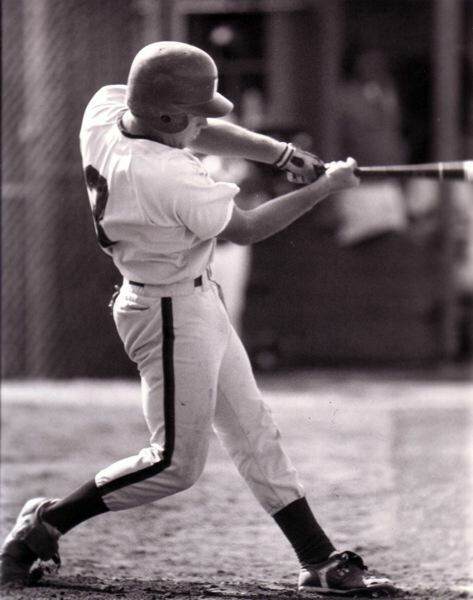 About 13 years ago Geoff got back into baseball as the head coach at Pacific Lutheran in Tacoma where he has averaged over 25 wins per season. Geoff is also the Assistant Athletic Director at PLU, so it might take a little more to pry him away, but I would love to see Geoff return to his alma mater and turn the Pilots into a team to be reckoned with in the WCC. Oh, and did I mention that Loomis is already a member of the UP Sports Hall of Fame? Yes, in our AD we trust.....but as much as Loomis may like Portland, he's got a really good gig going at PLU. Sounds like another chip falling today...and another chip on the table. U of AZ is reportedly hiring Jay Johnson (Univ of Nevada). That would mean Nevada is now open and added to the list. So, in addition to Portland, there's Northwestern, Baylor, New Orleans, James Madison, Eastern Illinois and now Univ of Nevada. Well, UP fans waited 41 days after the end of the Women's Basketball season last year before a new coach was named/hired, and so far it has been "only" 23 days since the last game of the baseball season....so I guess we should just settle back and attempt to learn patience while awaiting the hiring of a new baseball coach. I would guess the prime candidates for the job are men with school age children, a home, a good salary, and ties to their community.....so it may not be easy to pry them away from their current positions without the right in$entive$. PBS recently aired a couple of programs about the burden that military families must endure because of frequent deployments and the difficulty of the family readjusting to dad or mom returning after a 6 to 14 month absence, but uprooting the family to move across the country or overseas every couple of years can be especially tough on the kids. It's something to think about when accepting the always tenuous position of a coach....especially if you're already in a good position in a good location. Jack Legget from Clemson is looking for a gig. They just fired him. Had a winning record. DoubleDipper wrote: Well, UP fans waited 41 days after the end of the Women's Basketball season last year before a new coach was named/hired, and so far it has been "only" 23 days since the last game of the baseball season....so I guess we should just settle back and attempt to learn patience while awaiting the hiring of a new baseball coach. Oh the heck with patience, let's just hire Geoff Loomis! He's a UP Alum, he's got strong Portland ties, he's a member of the UP HOF, and he's a winner! Just announced and posted on website. Geoff Loomis it is. Raider1 wrote: Just announced and posted on website. Geoff Loomis it is. An excellent hire in my estimation. I believe it's important to have coach that is not only experienced, but has the passion for UP, Portland, and baseball. From my very limited perspective, it seems UP has continued to develop a good pitching and catching staff, but has been lacking in timely hitting and leadership. The only way to change the direction of the program was to bring in a proven winner with a passion for the game, but it also was important to bring in someone who understands what it means to be part of the University of Portland culture and to be a Pilot! Geoff still holds the career record for batting at .372.....let's hope someone breaks that record in the near future. DoubleDipper wrote: In recent weeks, as the high school baseball season comes to a close, it bodes well that a number of UP recruits for the coming school year are being recognized with various awards, but it was the recognition of Cody Hawken as the Washington Gatorade Baseball Player of the Year award today that caught my attention. Hawken, an outfielder, was selected by the Chicago Cubs in the 34th round in the recent MLB Draft. No word on what he plans to do, but I imagine Coach Loomis will have a word or two with him. Humbled and honored to be drafted by the Philadelphia Phillies. Thank you to all the people who helped me get to where I am today. DoubleDipper wrote: I believe it's important to have coach that is not only experienced, but has the passion for UP, Portland, and baseball. I agree whole-heartedly! Loomis seems like a good hire, and hopefully has the talent to raise the profile of the program. Talked to a guy today who spent a little time on the PLU team. Seemed to have a good impression of Loomis. DoubleDipper wrote: Hawken, an outfielder, was selected by the Chicago Cubs in the 34th round in the recent MLB Draft. Now Hawken has a big decision to make. He has signed with the University of Portland, and he will be receiving an offer from the Cubs. "I just want to keep playing baseball," Hawken said, knowing very well that he will be playing baseball, whether at college or for a minor league team within the Cubs farm system. He has told the Cubs what it will take for him to forgo college. And if the Cubs match that number? "I'm gone!" he said without hesitation. One can only hope Hawken's "number" is good enough to get him an excellent college education. I don't know how many 34th round draft picks make it to the "bigs," but I would imagine the odds are against him.